Card collection is a facilitated process that involves the use of cards to gather ideas from people, especially where a diversity of answers is expected. Useful for groups between 12 - 20, larger groups may be sub-divided into smaller groups. Starting with a question, ideas are captured onto cards and later clustered based on similarities. Once these clusters are labelled, they can be prioritized or elaborated on further. Card collection is described by Neill McKee (former Chief, PCIS, UNICEF Bangladesh) with Dr. Hermann Tillman and Dr. Maria Salas in their Visualization in Participatory Programs Manual (1993) used during planning processes for social mobilization and communication in UNICEF-supported programmes in Bangladesh. 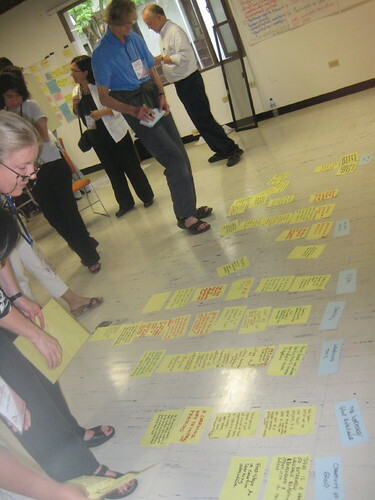 Using a combination of facilitation tools, VIPP has its roots from Latin America and Germany. These are derived from key works by Paulo Freire, Orlando Fals Borda and Eberhard Schnelle (Metaplan) among others. When a group has finished a brainstorming process, they often want to categorize the resulting list of items. This is natural. Most people cannot hold long lists in their head; they get overwhelmed. The group has to find some way of reducing the list to manageable number of items. Creating categories is a relatively challenging task for a group, because people don’t easily reach agreement on the meaning or the importance of a given category. Therefore, the task takes time. Sorting, on the other hand, is comparatively straightforward once the categories are well defined. Facilitator writes out the question that needs to be answered on a flipchart and explains clearly that participants are required to think about the question and come up with some ideas. Participants are asked to review and revise the clusters again if needed. The facilitator tidies up each cluster, and asks participants to create a title/ label for each cluster.